A good posture and proper spinal alignment are often overlooked aspects in regards to the management of neck pain. A pillow designed for neck pain helps you achieve just that. Many people rely on anti-inflammatory medications and pain-relievers, often prescribed by doctors if surgery is out of the question. But, your first move should be choosing the right neck pain relief pillow. Neck pillows or cervical pillows come in handy when looking to improve sleep that is often disrupted due to neck pains. They are specifically designed to give your neck the support and lift that it needs in order to maintain a neutral position as you sleep. This guide aims at providing you with the necessary information that you need in order to make an informed choice when it comes to choosing the best pillow for neck pain. Pain Management: Neck pillows, especially those made from memory foam, shape up around your neck, distributing the pressure equally. When you sleep with your neck at an odd angle, you will most definitely scream in the morning. A neck pain can ensure that your back and head are perfectly aligned with your neck. Support: They help to improve support to the neck by maintaining its natural curvature as you sleep. This much needed support help to alleviate any neck pain, headaches associated with poor sleeping posture, jaw and upper back pains. This also has the added benefit of improving posture not only while you sleep but on a more long term basis. Relaxation: They help to relieve the neck muscles of any stress or strain making it easier for their users to relax. This in turn has the benefit of improving sleep and adding comfort for the user. This could prove beneficial for people who have undergone any form of surgery, cosmetic or otherwise, or people who have suffered a head or neck injury. Improved breathing: By maintaining the proper alignment between the head, neck and the spine, cervical pillows aid in keeping the airway open as you sleep. This may be particularly helpful for snorers or those suffering from other respiratory issues. Comfortable sleep is not only a factor of our choice of mattress and beddings; it is also influenced by our pillow choice. Our choice of pillow loft to be specific will greatly influence whether or not we wake up with a stiff or sore neck the next morning and every other morning after that. Depending on your sleeping position of choice, you will either require a high, medium or low loft pillow. Having the wrong pillow height will cause your neck to bend in an awkward position consequently straining your neck muscles and resulting in neck pain. A choice as simple as changing your pillow to one that is suitable for your sleeping position could go a long way in keeping neck pains at bay. If you are a back sleeper, then a thin pillow is best suited. It will keep your neck from folding inwards towards your chest; a position that is not only bad for your neck but for your breathing as well. Side sleepers will require a pillow that is thick enough to fill the space between the head and the shoulder. This is important as it help maintain the necessary spinal alignment. If you are a side sleeper, be sure to keep in mind your body size in relations to the pillow thickness. Broad shouldered side sleepers will find that a high loft pillow would be best suited while the more petite side sleepers may find a low loft pillow to be more useful. For stomach sleepers, perhaps the first piece of advice they will receive would be to try and find either a comfortable back or side sleeping position. Sleeping on your stomach naturally causes tension in the neck and will most likely result in the soreness of neck muscles. However, if an alternative sleeping position is not an option then stomach sleepers should employ the use of a very thin pillow or completely do away with the use of a pillow. It takes more than just a quick internet search to find the best pillow for neck pain. Considerations such as the material and firmness of the pillow, the ease of use, size of the pillow and your sleeping position all play an important role in ensuring that you arrive at a suitable pillow to help alleviate your neck pain. Sleeping Position: Everyone in the world will tend to sleep in either of three positions. While people that sleep in all three positions in any given night are an exception to the rule, most people tend to either be stomach sleepers, back sleepers or side sleepers. Your sleeping position will generally determine the pillow thickness that you go for. A thicker pillow would be best suited for a side sleeper while a thin pillow would work for a stomach sleeper and a medium loft pillow will work best for back sleepers. Firmness: The firmness of the pillow is determined by the type of insert used. Sleeping on a pillow that is too firm would be equivalent to having a rock for a pillow. We can all agree that such a pillow will make for a rather uncomfortable night’s sleep. Choose a pillow that is not too hard such that it will hurt your neck and neither is it too soft such that it fails to offer the necessary support. Material: The choice of material for the pillow insert will determine the pillow’s ability to provide the necessary support. Memory foam pillows are particularly suitable as neck pain pillows due to their ability to adequately cushion your neck against the effects of movement during sleep and evenly distribute the weight of your head. Their water filled counterparts are preferred due to the flexibility of adjusting firmness that is accorded to the user. Ease of Use: The ideal neck pain pillow is one that can be easily cleaned. Seeing that a pillow is generally a long-term investment, having one that is easy to clean and maintain would be a definite plus. Opt for a pillow that can either be machine washed or wiped down with cloth. Also, go for one that comes with a removable cover as this makes the process of cleaning it a much easier one. Size of The Pillow: Size is especially important for people who are often on the move and will need to take their pillows with them. Find a size that suits not only your bed are good travel neck pillows as well. Also consider the size of the neck pain pillow in relation to the size of your bed. Lastly, consider the pillow size in relation to your body size; especially if you are a side sleeper. Large pillows may prove to be rather bulky and thus uncomfortable for petite users while smaller sized pillows may prove to be ineffective for large people. Neck pains resulting from poor sleeping postures, injuries or surgical procedures have necessitated the creation of neck pillows. These pillow's primary purpose is to support the neck and alleviate the neck pain of users as they sleep. However, with the growing need for the product comes a myriad of options being introduced into the market. We have taken the liberty of listing seven of the best pillows for neck pains, including a review of their advantages and disadvantages. If you are suffering from neck pains, then comfort and adequate support are two key attributes of any pillow you buy. The Oxa Spring Bed Pillow has been included in this guide due to its ability to provide both support and comfort to it users regardless of their preferred sleeping position. It is designed to be soft and at the same time firm. The fabric of choice for this pillow’s removable cover is pure cotton while the filler material is polyester micro fibre. To help improve its firmness and fluffiness, the manufacturers have made use of a 3D spacer mesh fabric that holds up to 40 springs. The latter are responsible for giving the inner core of the pillow its adaptive feature. This aids the pillow in providing support whenever you lay your head on it by gently pushing back against the weight of your head. It measures 26 inches in length and 16.5 inches in width. To help improve this pillow’s comfort, tiny silk fibres, together with the breathable cotton outer cover, helps to enhance its heat dissipation capabilities and thus keep it cool throughout the night. What’s more, these pillows come with a warranty of a 20 year period from the manufacturer. This helps to inspire confidence in buyers about the quality and longevity of the product. The Cr Sleep Memory Foam Contour Pillow has been included in this guide due to its ability to provide a chance for its users to attain better sleep and no stiff neck in the morning. By providing support and comfort, it allows your neck muscles to relax and this relaxation effect is attributed to the gel-infused filling of the pillow. To add to its comfort, the outside of the pillow makes use of a jersey fabric while the inside makes use of gel-infused memory foam. Apart from being comfortable the jersey fabric is also breathable allowing for proper heat dissipation and air circulation within the pillow. To make it easy to maintain, the pillow comes with a removable and washable cover. Its contoured design makes it ideal for use by both side sleepers and those who sleep on their backs. When it comes to brand reputation, Sleep Innovation has created a name for itself in the pillow world. It is this brand’s reputation of manufacturing comfortable and supportive pillows that has earned the Sleep Innovations Contour Memory Foam Pillow a spot on this guide. Its contoured design incorporated a recessed centre making the pillow ideal for all sorts of sleepers. By restricting the curve of the neck from being pushed unnaturally forward or backwards, this pillow helps to not only improve alignment and relax the neck muscles; it also helps to open up the airways improving the user’s breathing. The Sure Temp memory foam used in this pillow allows for a comfortable night’s sleep by adapting to your body’s movements and distributing the weight and pressure evenly across the pillow. The material of choice for the removable cover is terry cloth. This breathable velour fabric allows for the pillow to stay cool allowing you to sleep comfortably. The fact that the cover is removable makes this pillow easy to clean and maintain. Comfort and style is what the Perform Memory foam neck pillow brings to the table. The outside of this pillow is made from polyester and bamboo blend. This allows it to be breathable thus comfortable. The inside is filled with special density memory foam that is responsible for ensuring your head and neck receive the support they need. Another plus for this pillow is the fact that it is devoid of heavy metals, an attribute that makes it environmentally friendly. It is designed to not only provide comfort but help improve overall body posture. With design contributions from a seasoned chiropractor, this pillow will help support and align the head, neck and back. It comes with a removable bamboo cover that makes it easy to clean and maintain. The versatility of use is always an added advantage for any pillow. The versatility of the Custom Sleeping Cervical Orthopedic pillow is what earns it a place in this guide. With this pillow, you are able to adjust the fill as desired. This is made possible by an opening at the bottom that not only allows you to adjust the neck support but to spread around or reduce the fill until the pillow takes the desired shape and firmness. It comes with a removable cover that can be machine washed. To make the task of maintaining the pillow much easier, the pillow itself can be machine washed. To make it comfortable, the manufacturers make use of proprietary gel-memory shredded foam as the material of choice for the pillow’s filling. Due to the fact that users have the option of adjusting its firmness, this pillow can be used by all types of sleepers. What’s more, it comes in king and queen sizes as well as firmness options. Neck pain is a phenomenon that tends to occur in a majority of people’s lives regardless of the sleeping position. The manufacturers of the Mediflow Original Water base Pillow understand this and have thus created a pillow that is compatible with side, back, stomach and all the above types of sleepers. As the name suggests, this pillow is designed with a water pouch that is situated at the base of the pillow. It has a cotton fibre covering that is stuffed with polyester that adds to the pillows comfort and supportive capabilities. Thanks to the water base, users can easily adjust the firmness of this pillow as needed. This feature is what gives the pillow its versatility of use. Back and stomach sleepers can reduce the firmness as needed while side sleepers can add water to it to increase its firmness. To make it easy to clean this pillow is made to be easily machine washable. This guide would be incomplete without the Xtreme Comfort Shredded Memory Foam Pillow. This pillow comes in a variety of sizes and the use of shredded memory foam as a filling makes it easy to adjust its firmness. The latter is particularly helpful since different types of people have different pillow needs. The shredded foam alongside with the bamboo cover and a micro-vent system make the pillow breathable and give it the ability to remain cool as you sleep. The materials used in the manufacturing of this pillow are toxins free and thus environmentally friendly. Thanks to the use of shredded foam, you can mould this pillow into a comfortable and supportive shape of your choice. The removable and machine washable cover makes it easy to maintain. Neck pain can be as a result of injuries, poor posture, and surgical operations or may be a symptom of an underlying health issue. Neck pains can take the form of a stiff neck that limits your ability to move your head, a localized sharp pain, and soreness and in some extreme cases a travelling pain that spreads down to the rest of your body. People suffering from neck pains will tend to have trouble sleeping regardless of the level of pain. There are, however, a number of ways in which one can manage their neck pain. Exercise: Keeping your neck muscles active is another great way to handle neck pains. General body exercise such as aerobics that increase oxygen flow to the muscles throughout the body come in handy as they ensure enough blood and oxygen supply to the neck muscles. Neck stretches and neck strengthening exercises also help to improve one’s posture and keep the neck muscles active. It is, however, advisable to do these exercises in moderation (especially the neck strengthening ones). The point is to make the pain go away and not to add to it. Starting small and giving the neck enough time to rest will keep from straining it and worsening the pain. Hot And, or Cold Treatments: When the neck pain is as a result of an injury, the use of an ice-pack will come in handy to reduce inflammations and pain. The use of a warm towel or other hot treatments will be helpful in ensuring the relaxation of the neck muscles as well as improving blood flow to the neck region. Hydrate: Staying hydrated has numerous benefits to the body. When it comes to managing neck pains, hydration helps to slow the rate of vertebrae disc degeneration by helping to maintain the proper disc height. This in turn helps improve the alignment of the spine and reduces the pressure exerted on the vertebrae and thus reduces neck pain. Be Mindful Of Your Phone Habits: We spend a considerable amount of time each day on our phones. We often get into the habit of cradling our phones in our necks when we are looking to multi task. By doing so, we force our necks into awkward positions that cause undue strain to the neck muscles. 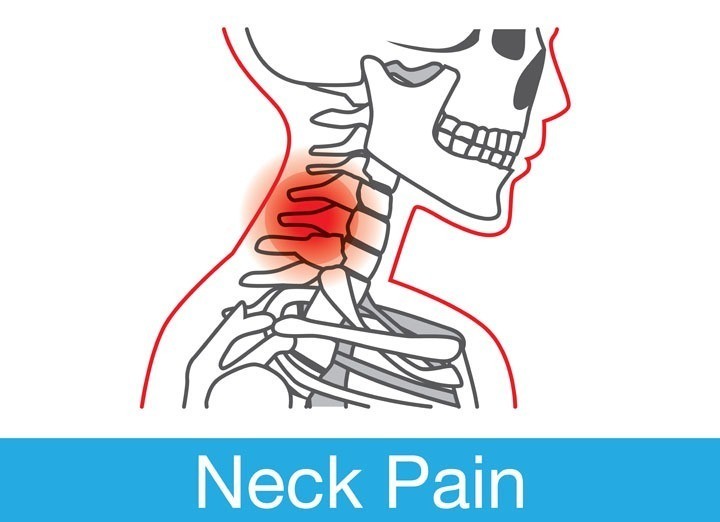 Neck pain as a result of frequent phone use can also be as a result of favouring that chin to chest position when we are texting or browsing (also known as text neck). If you have to multitask while on the phone then make use of a hands-free device. Also, get into the habit of holding your phone to eye level while texting or browsing in order to reduce the strain you cause on your neck. Diet: A magnesium rich diet could go a long way into relieving neck pains. Magnesium is a helpful mineral when it comes to muscles movements as it helps in the relaxation and contraction of muscle movements. Soy products, fruits, beans and vegetables are rich sources of magnesium. Use The Right Chair: In today’s technological world, we spend most of our waking hours working in a seated position looking at one gadget or the other. Due to the long hours spent while seated, it is important that you find a chair that helps you maintain a proper posture. A chair with a head rest may prove beneficial to improve the neck posture. Visit A Specialist: Visiting a physical therapist, a chiropractor or an acupuncturist could go a long way in helping to manage pain. Since these specialists are trained on matters of the human anatomy, they are best placed to advice you on the right kinds of exercises and remedies that your neck pain requires. Pillows for neck pain come in many shapes and sizes. While these cervical pillows are useful in making it possible to enjoy a good night’s sleep, it may be useful to combine the use of these pillows with other pain management treatments. With that said, you still need to rest at the end of the day. There are numerous cervical pillow options to choose from. Depending on the type of sleeper you are and the severity of the pain, some pillows may be suitable while others may just make the situation worse. Be sure to take these factors into consideration when shopping for the best pillow for neck pain. It helps to take a look at third party reviews. Pillow needs are highly specific and differ from one individual to the other. While there is the possibility of encountering biased reviews, these third party reviews will act as an eye opener to the general performance of the different pillows.